Accompanying the developing rural tourism in the country, the events dedicated to local dishes and products have grown as well. The region of Sibiu, which will be a European Region of Gastronomy next year, stands out with many and diverse activities, but many other parts of the country accommodate food-themed festivals. These can be a good opportunity to explore beautiful regions and get a taste of Romania. A selection below. 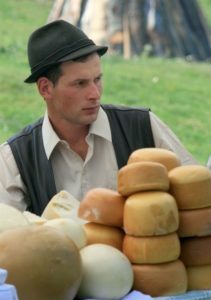 The rural region of Mărginimea Sibiului, close to Sibiu, is famous for the cheese delicacies produced here including ‘telemea’, ‘urdă’, and ‘caș’. It was even recognized as a European Destination of Excellence in 2015, under the theme tourism and local gastronomy. To further promote the area’s traditions, this festival is organized in the commune of Rășinari. Visitors can also sample here the local cheese and meat products and dishes and enjoy a program of folkloric music concerts. This year the festival takes place on August 25 and August 26. This event takes place at the beautiful Brukenthal Palace in Avrig, also in Sibiu county. The palace used to be the summer residence of the baron Samuel von Brukenthal, who is said to have introduced the growing of the potato in the area. A variety of potato dishes are prepared for the event, scheduled from October 7 to October 14, and a dedicated Facebook page should have further updates. 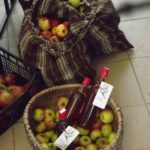 The villages of Fîntînele (Cacova) and Sibiel, in Mărginimea Sibiului, organize this fair where visitors can sample and purchase traditional apple varieties, thus helping preserve the local heritage. Apples and pears, apple stum (unfermented juice) and apple vinegar, walnuts and other traditional products go on sale here. The event takes place on October 21 in Fîntînele and on October 28 in Sibiel. In Buzău county, the commune of Berca is known for being close to the area of the Muddy Volcanoes. It also hosts this festival dedicated to the popular Pleșcoi sausages, made out of mutton and seasoned with garlic and chili peppers. The sausages take their name after the Pleșcoi village, in Berca, the place where they originated. This year the event is scheduled to take place on October 6 and October 7. In Mehedinţi county, in Romania’s Banat region, the commune of Şviniţa is host to a festival promoting the local crop of figs. 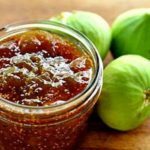 Traditional fig-based products such as jams, brandy, and cakes are presented at the fair, where a traditional dress parade and folkloric performances of groups from Romania and Serbia also take place. This year the event is scheduled for September 1, and this Facebook page has more updates. This is a festival focused on the cabbage rolls filled with minced meat known in Romanian as sarmale. 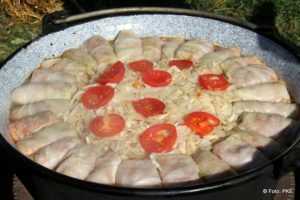 The first edition of the sarmale festival was organized in Pusztamérges, Hungary in 1994, as Romania’s neighbor also includes the cabbage rolls among its traditional dishes. In 1995 it was held in Praid, in Harghita county, and, after a four-year period of alternating between the two countries, it has been going on in Romania, in the locality also known for its salt mine, another tourist attraction. The program includes various music concerts of performers from both countries, some held inside the salt mine, sport events and a program for children. The event has a competition part as well, where the smallest, biggest, longest and most original sarma are picked. The festival is usually organized towards the end of September. You can check the event’s website for updates. In the northern region of Bucovina, the Ciocăneşti commune hosts this trout festival that covers fishing and gastronomy competitions, a traditional dress parade, folkloric performances, wine tastings and traditional meals. This year the event is at its 15th edition and will take place on August 18 and 19. It is one of the many events in the commune, which also hosts an egg painting festival, held before Easter, and the Tillage Week. Not very far away from Richiş and Biertan, the commune of Moşna in Sibiu county is made up of three villages, two of which have fortified churches. It is host to a Cabbage Festival that held its 11th edition last year and the ecological cabbage crops grown here are famous in the region. This year the event is held on October 13 and October 14, giving visitors the opportunity to sample various cabbage-based dishes. Plenty of other food events are organized year-round throughout the country focusing on the local production and dishes, including an Aspic (Răcituri) Festival held in Tismana, in Gorj county, the Fish Borsch Festival in the Danube Delta, and events showcasing the Bazna or Mangalița pork meat varieties. If you cannot make it to any of these destinations, there is always the option of going to the city’s traditional markets or to the regular fairs that bring local producers to the capital or other larger cities.